[i] J.D. Syring, Statement Before the Senate Armed Services Committee Subcommittee on Strategic Forces, April 13, 2016, https://www.armed-services.senate.gov/imo/media/doc/Syring_04-13-16.pdf. [ii] Jeremy Binnie, “Iran Claims Zolfaghar Missile has 700 km Range,” IHS Jane’s Defence Weekly, 28 September, 2016, http://www.janes.com/article/64149/iran-claims-zolfaghar-missile-has-700-km-range. 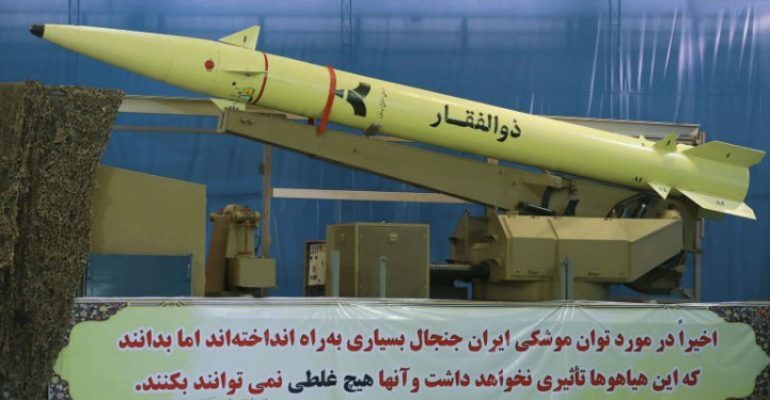 [iii] Behnam Ben Taleblu, “Assessing the Latest Iranian Ballistic Missile: The Zulfiqar,” Qualitative Military Edge, Foundation for Defense of Democracies, September 29, 2016, http://militaryedge.org/analysis-articles/assessing-latest-iranian-ballistic-missile-zulfiqar/. [iv] Associated Press, “Iran ‘Determined to Boost Military After U.S.-Israel Deal,” Real Clear Defense, September 21, 2016, http://www.realcleardefense.com/articles/2016/09/21/iran_determined_to_boost_military_after_us-israel_deal_110100.html. [v] Michael Rubin, “Iran Launches New Zulfiqar Ballistic Missile,” American Enterprise Institute, November 16, 2016, https://www.aei.org/publication/iran-launches-new-zulfiqar-ballistic-missile/.